Hello everyone, I have a special and cute card to share with you today. This card is made using Penny Black stamp sets. And I have watercoloured embossed images on this card. This is one technique I enjoy a lot. Makes me calm and relaxed watercolouring. Anyway, here is my card. I have used three stamp sets from Penny Black to make this card. The girl image is called XOXO. Love this little girls image. Adorable. 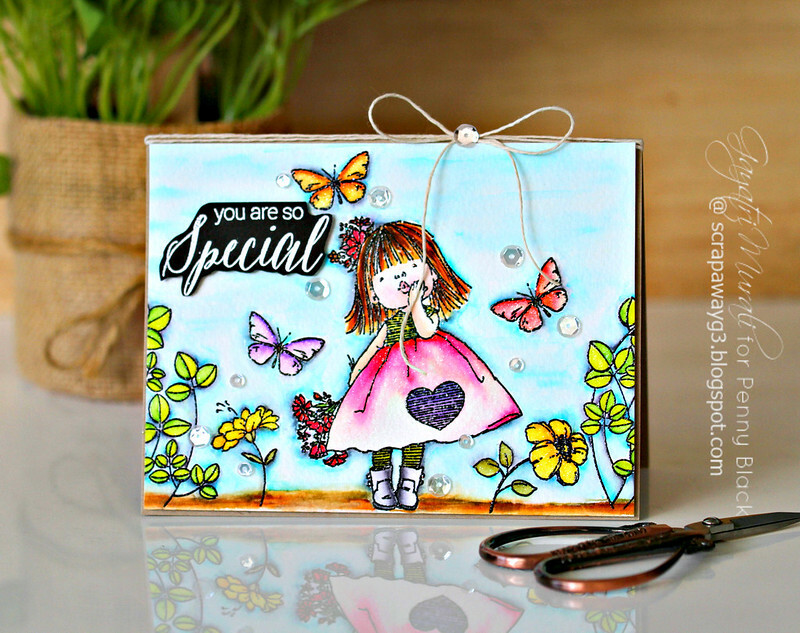 I combined this set with Penny Black All Bloom stamp set for the greenery around the girl. Finally the sentiment is from Special Thoughts stamp set. Yo make this card, I black heat embossed the images on to watercolour paper. Then I coloured the images with Zig Clean Brush markers. These pens are my favourite to watercolour as I feel I have better control colouring with these pens. I also use an aqua brush to get waterdown and add shading to the colouring.. I grounded the images by added land to the bottom of the images and watercoloured the background with blue colour. To make the images pop, I added some grey shading to them. 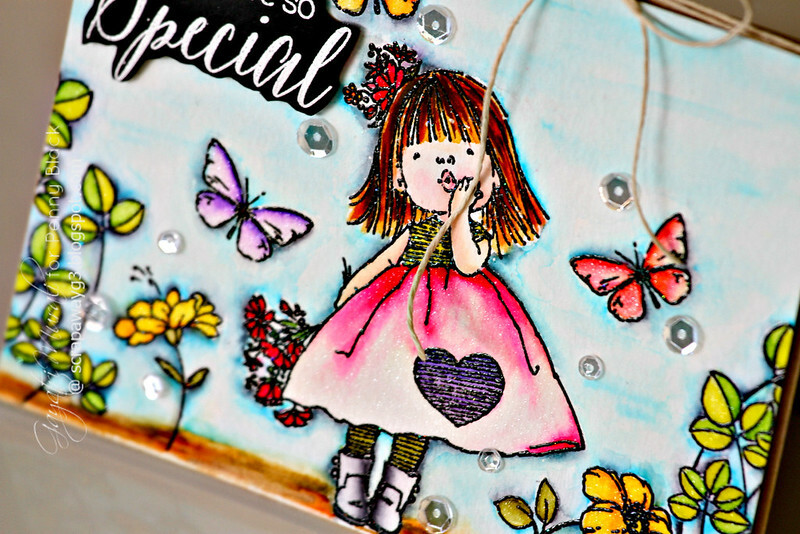 Finally, I added shimmer to the girl’s skirt, butterflies, flowers and leaves using Wink of Stella clear shimmer pens. The sentiment is white heat embossed on black cardstock, trimmed and adhered using foam adhesive. The watercoloured panel is trimmed to about one third of an inch smaller to the size of the card front and adhered to the kraft base using foam adhesives. I embellished with Sparkly Clear sequins and twine bow on the top. Hope you like my watercoloured special card as much as I do. All the products are available to purchase from Penny Black Store. Thanks for stopping by my blog today. Have a lovely Monday! Totally gorgeous Gayatri. I've just bought the little girl stamp and can't wait to stamp and colour it. Such a cute card. I love your coloring of it. 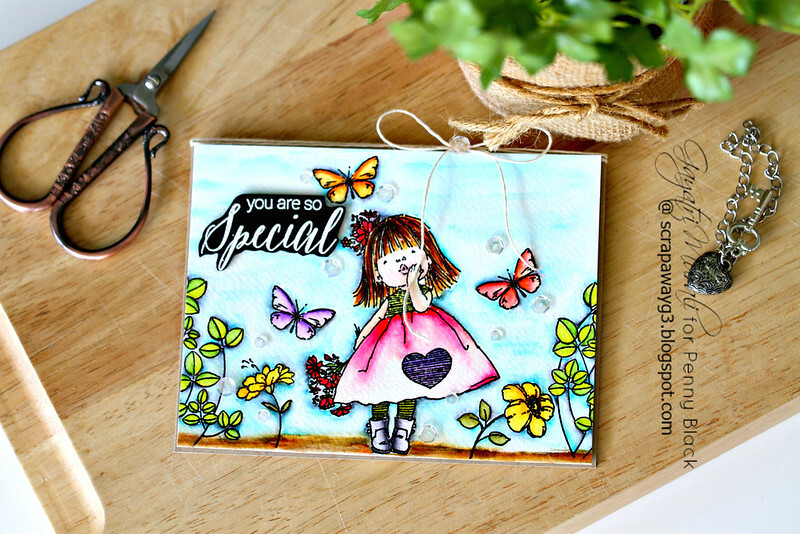 Gayatri, this is so beautiful, and I love the scene you've created for this sweetie! Your coloring is simply gorgeous! I love it all! Hugs, sweet friend! Gorgeous water-coloring, Gayatri!! Love this cute scene that you created so much!